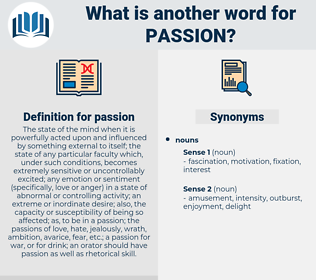 What is another word for passion? The state of the mind when it is powerfully acted upon and influenced by something external to itself; the state of any particular faculty which, under such conditions, becomes extremely sensitive or uncontrollably excited; any emotion or sentiment ( specifically, love or anger) in a state of abnormal or controlling activity; an extreme or inordinate desire; also, the capacity or susceptibility of being so affected; as, to be in a passion; the passions of love, hate, jealously, wrath, ambition, avarice, fear, etc. ; a passion for war, or for drink; an orator should have passion as well as rhetorical skill. affection, hobby, mania, warmth, sentiment, enthusiast, eagerness, interest, zest. enthusiasm, fascination, fervor, excitement, dedication, emotion, devotion, obsession, vehemence, motivation, romance, anger, wrath, feeling. aversion, distaste, antipathy, repulsion, disgust, loathing. calmness, apathy, happiness, disinterest, dislike, hate, lethargy, hatred, health, dullness, advantage, indifference, benefit, cheer, pleasure, comfort, calm, joy. celibacy, aloofness, antagonism, long-suffering, Woodenness, repugnance, hostility, charity, enmity, abstinence, insensitiveness, leniency, reserve, coldness, Insensibleness, peacefulness, coolness, dryness, reservedness, lenity, impassiveness, nausea, self-restraint, chastity, Collectedness, love, misanthropy, rancor, reticence, taciturnity, stiffness, mildness, self-control, animosity, revulsion, Frigidness, chilliness, insensitivity, amiability, peace, forbearance, frigidity, peaceableness, gentleness, patience, impassivity. And when she met him there on Saturday morning, she must hold down her passion as she would hold down a mad dog. Then he closed the door behind him, threw himself on his bed, and burst into a passion of tears. ardor, wildness, fire, fervor, ardour, infatuation, fervour, abandon, fervency, storminess, fervidness. concupiscence, physical attraction, sexual desire, feeling, eros.